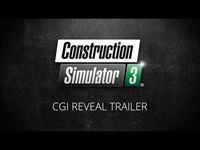 Moenchengladbach/Germany, October 25, 2018 – With Construction Simulator® 3, publisher astragon Entertainment and weltenbauer. SE are happy to announce the upcoming successor to the popular simulation games Construction Simulator® 2014 and Construction Simulator® 2 today. Construction Simulator® 3 for iPhone® and iPad® as well as smartphones and tablets using the Android™ operating system is planned to be released during the first half of 2019. Players who would like to test the game before the official launch are cordially invited to apply for the closed beta test, which will start shortly!